For the day 2 of blogging marathon#26 under the theme pick one ingredient and make 3 recipes is a tempting sweet made with corn. I have already posted a halwa made with corn flour which is known as Karachi halwa but today's recipe is with the sweet corn kernels. I saw this recipe in a T.V cooking show competition and the measurements were not clearly mentioned.So with those ingredients I recreated the recipe according to our taste buds. Cook the corn kernels with a cup of water in a microwave oven for 5-6 minutes.Drain the water completely after cooling grind it to a fine paste with the milk as needed. Now heat a pan with 2tbs of ghee and add the corn paste and stir it well till the smell goes away.Add the sugar and mix well.Stir it till the mixture becomes glossy and thick. At this point add the grated khoya and mix it well.Add the remaining ghee. Stir it till everything comes together and the ghee leaves the sides of the pan,put off the stove.Finally crush the saffron threads to it and give it a mix. 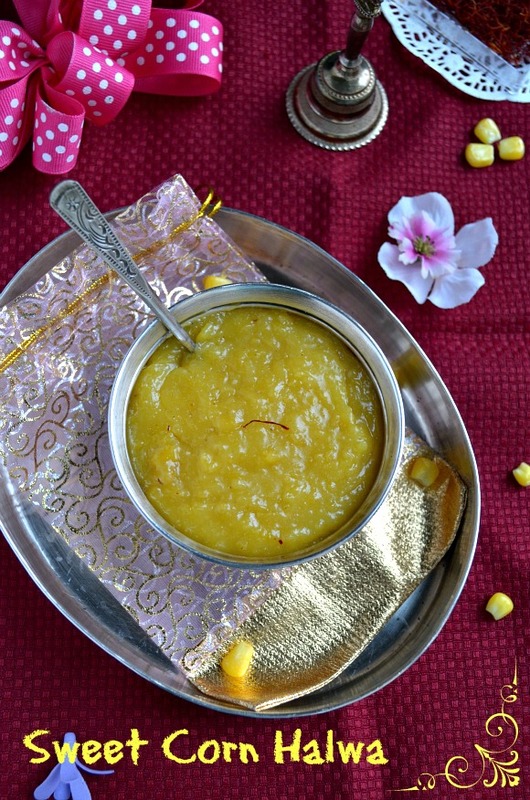 Delicious and mouthwatering Corn Halwa is ready. The halwa doesn't need any fried nuts and cardamom powder the flavor of the saffron is enough.But if you want you can add fried cashews and almonds. 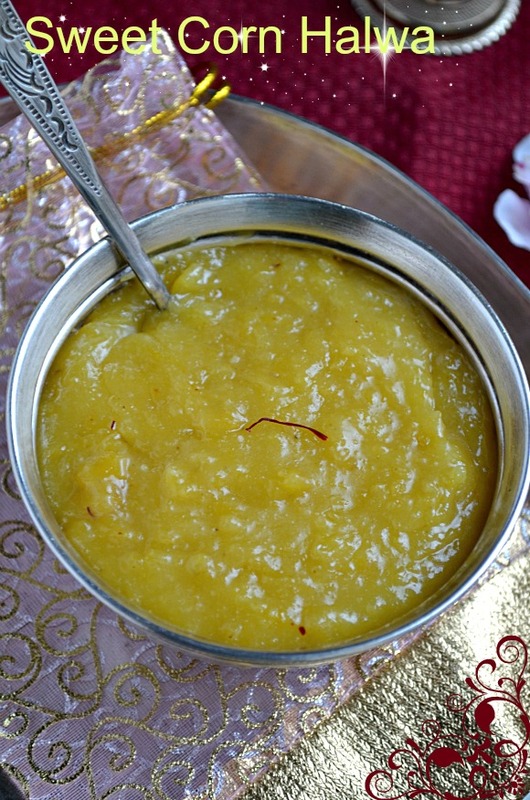 Make sure the corn is grind smoothly to a fine paste,thats is very important for the texture of the halwa. hmmm.. looks very nice & tempting. How does this taste & is the corn flavour strong? Absolutely mouthwatering!!! Pass me that bowl plz..!!! 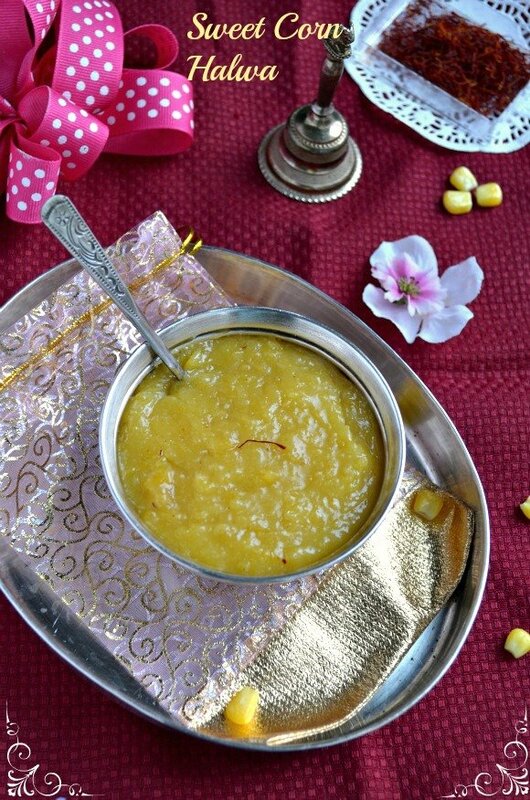 wow..Sweet corn Halwa supera erukku Nalini, lovely texture and color...looks too delicious and tempting...well done! wow delicious halwa and well presented dear !! Different and delicious halw !tempting clicks..
Love that glossy and very attractive halwa Nalini, you are tempting me to make some. Nice look and texture.nice presentation. Halwa looks so glossy and tempting. Nice glossy texture, looks super tempting..
omg nalini, it looks fabulous.. superb halwa..
Delectable Halwa.. I am drooling literally on your pictures.. Sounds so delicious..I know corn flour halwa, so this must taste just as delectable! So delicious and tasty!!! very mouthwatering!! I too have seen several desserts using corn over TV. This halwa sounds delicious. Have always made a savory version...I am sure this shall taste good too! Looks so inviting and colourful..
Beautiful clicks Nalini...really good one :)!